Sign up for the email newsletter to receive the latest special offers - Sign Up Now! Before a series of "Job-like" events hit her life, Jennifer's story began as a successful classical vocalist as she graduated from the prestigious Manhattan School of Music. She sang with famous symphonies, starred in theater productions and operas, taught voice at the local university - it was all going well. Then, a pregnancy went terribly wrong and Jennifer nearly died. A few weeks later, her beloved father was diagnosed with the fatal Lou Gehrig's Disease and eventually passed away. After going through a successful pregnancy, her baby boy's behavior became more erratic and frightening, leading to a diagnosis of Sensory Processing Disorder (SPD), thrusting Jennifer and her husband into the roles of parents of a special needs child. To our knowledge, this is the first book of any genre to talk about SPD from the parent's perspective. 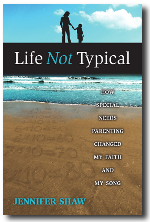 Jennifer's desire for this book is to offer much-needed hope and practical help to other parents who may be going through similar circumstances with special needs kids. It is also a book of encouragement, that in the midst of any trial or circumstance, God's grace is ever present. For more information and additional purchasing options, click here. If you knew you had only a few years to live, how would you use that time? Would you allow despair to overwhelm you or would you find a way to still have a life? How would you keep the fear of death from ruining the days you had left? When Dave Chilcoat was diagnosed with Lou Gehrig's disease, a fatal illness for which there is no treatment and no cure, he had to face these questions in reality. The day he received his diagnosis Dave began writing a journal. Then, to keep family and friends updated on his condition, he began posting his journal online. He wrote weekly for nearly three years and his chronicle was eventually read by tens of thousands around the world. This book is the heart of that journal, as edited by his wife Beth Chilcoat. It is the living account of an unshakable faith in God's goodness and grace, and a heart open to God's purposes. For more information and additional purchasing options, click here. Copyright© 2019 Jennifer Shaw. All Rights Reserved.